This New Years Day run started 2012 off perfectly. 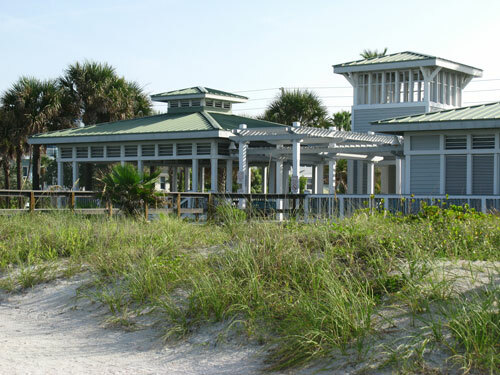 It is like Paradise on the laid-back Florida Gulf Beaches, and morning fitness sets the tone for the rest of a perfect day on beautiful Treasure Island Beaach. 2012 came in sunny, cool, and clear. I wanted to be on the beach at sunrise and put in six good miles (Sunrise 6) before the tourists got up. It is tough to run with people near the edge of the surf because they just do not pay attention to runners when the are overcome with the beauty of the Gulf on a picturesque Florida beach morning. Since I love living here in Paradise, I certainly do not want to disrupt a visitor's experience by having any close calls of a collision. A New Years day run is the perfect way for me to start January of on a positive step. 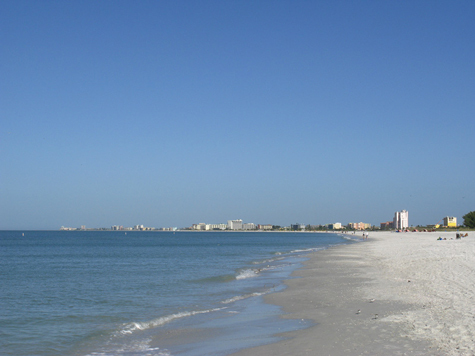 The Treasure Island beaches are wide and solid at low-tide. (Running at high-tide is a chore.) It is extremely quiet, only the seagulls and gentle surf can be heard. There is no street noise. No heavy-duty motorcycles. No blaring sirens of emergency vehicles. No cars honking in traffic. Once in awhile, I'll see another runner, or a guy heading off to fish on one of the three jetty's here on Treasure Island...but that's about it. This is Paradise at its best, an I am consciously thankful that I get to enjoy it, all by myself, for about an hour. Making the decision to retire in Florida, and becoming a travel writer on the Internet to make money, were two of the smartest things I have done in the past 10 years. 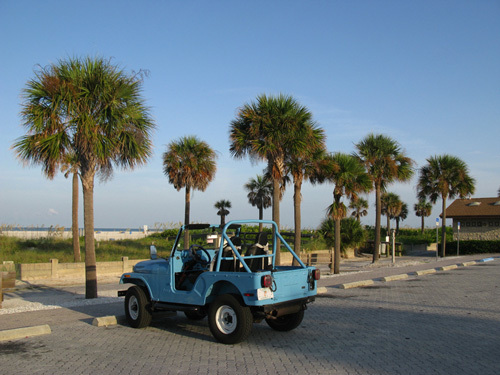 Living the Florida beach life allows you to slow way down and enjoy the outdoors and the peacefulness of the beach. 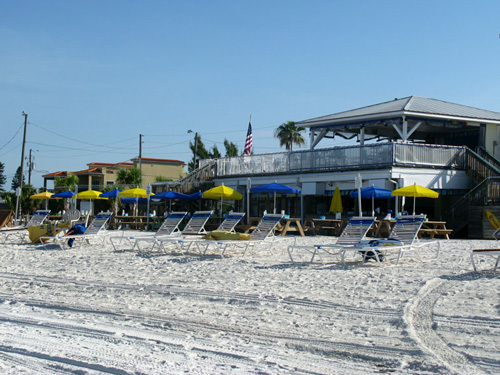 You can get in touch with your spirituality very quickly on the Florida Gulf Beaches. As a matter of fact, our pastor at First Unity of St Pete Church, Rev. Temple Hayes, reminds us almost every week how fortunate we are to live in such a beautiful place. I'm recovering from High-hamstring Tendinitis. It is frustrating because I trained well all through the heat and humidity of July, August, and September...only to get this injury when sprinting up Johns Pass Bridge on the first semi-cool day in October. I have been in physical therapy for it since the middle of November and it is about 95% better. I had only been allowed to go 3 miles, three times per week, at a very slow pace. I wanted to push it a bit, today, since the intense pain (inflammation) is almost gone. I started from the parking lot at 107th Avenue & Gulf Blvd, and headed north toward John's Pass. I ran easy for 10 minutes, then headed up toward Gulf Blvd. at the far end of the Treasure Island Beach Trail where I could do some pull-ups (17). 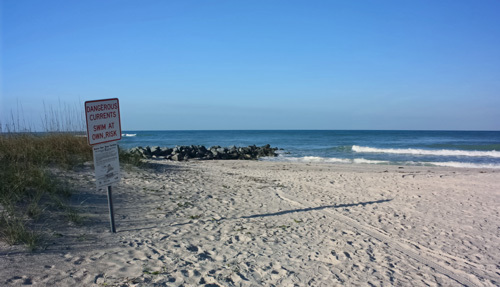 I jogged back down to the shoreline, coasted for two minutes while my breathing returned to normal, then increased my speed for five minutes up to the jetty/seawall off John's Pass on Sunshine Beach where I elevated my feet up on a park bench and did 51 push-ups. 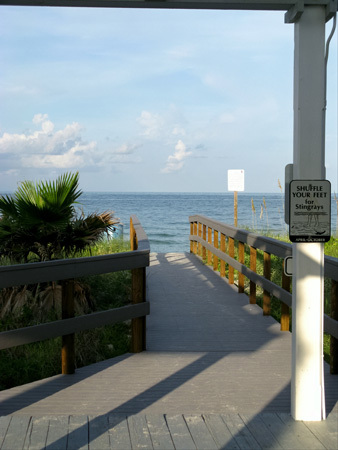 Then I headed south, toward Sunset Beach jetty, three miles away, and alternated five minutes of up-tempo (not sprinting) speed, with three minutes of slogging along, in between, to get my breathing back to normal. Beach running takes on many forms, and this was at the bottom of the ladder where beach sprint intervals are concerned. The New Years Day run was only the second 6-miler I had done since September, and I was feeling it. I turned around down at the southern-most jetty there at Blind Pass, and headed north, again. It was 1-1/2 miles back to the parking lot, but I wanted to stop at Sunset Beach pavilion to do another set of push-ups, and get some water. After that, it was a straight shot back to my Jeep. After my run, I went out into the Gulf. It was brisk 64 degrees, but I read in Mark Sisson's Primal Blueprint 21 Day Body Transformation that he has been doing this in a swimming pool to help prevent injuries. Since he was a national-class marathoner who went to the Olympic Trials in 1980, I figured he knew his stuff. It was actually refreshing...and way to cold for stingrays! Check it out. What a beautiful morning in Paradise. I am all alone and ready to run. 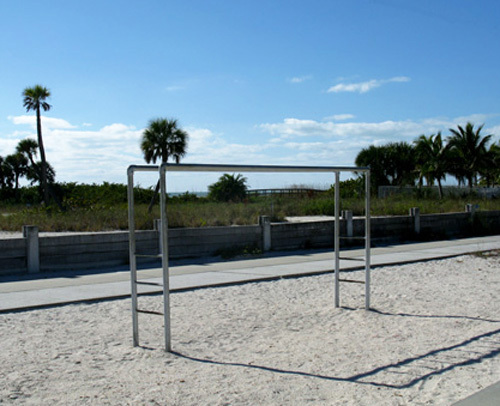 After about a mile, I headed back toward the Treasure Island Beach Trail, where I knew I could do some pull-ups. At John's Pass Jetty, I stopped again and dis some push-ups with my feet elevated on the park bench. 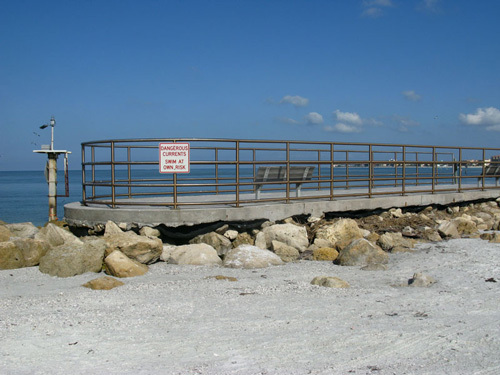 I finally made it to Sunset Beach Jetty (Blind Pass) where I stopped to stretch stretch my hip/hamstring for about a minute, then headed back to the parking lot, a mile and a half away. I stopped at the Sunset Beach Pavilion (about a half-mile from the jetty) to get some water at the fountain, and do some more push-ups. Here's the view I have when I am doing push-ups. Trust me, I am real thankful to live in such a beautiful place. A New Years Day run has been a tradition of mine since I retired here in 2006...and I plan to continue it as long as I can. Tax deductions for a home business will put $1000's of dollars back in your pocket!